It’s Been Beautiful: Soul! and Black Power Television. By Gayle Wald (with photographs by Chester Higgins). Durham, N.C.: Duke University Press. 288 pp. $25.95 (trade paperback). This book understands the right story to tell—one of, in author Gayle Wald’s words, “a fragile alliance of liberal and radical interests, both public and private”–and, thankfully, arrives at the right places. “Soul!” (1968-1973), a nationally distributed public television program that could loosely be described as the radical sister of the more commercial “Soul Train,” fired the imagination and reflected the multi-faceted sensibilities of its Black community of viewers. Using largely untapped wells of research about the early days of American public television vis-à-vis Black America, Wald relates a nuanced story of how the condescension of white American public television officials seeking to provide an outlet for the angry Black community in the late 1960s led to a (largely) Black-controlled showcase of the Black Arts Movement on (largely) Black aesthetic terms. It is the restrained approach, however, of choosing as this book’s scholarship basis intellectual sources outside the “soul” of Black/African folks that makes this book strangely appealing and more than a little irritating. “Soul!” (episodes of which can be found online) was first a product of Black insurrection. Reacting to that outpouring of anger and violence, white funders, somewhat accidentally, allowed a Black producer, Ellis Haizlip, to have his way. WNET-Channel 13 (now known as Thirteen), then and now the New York-based flagship station of the PBS collective, wanted a companion show to “Black Journal,” its Black newsmagazine. The initial and white idea of a “Black Tonight Show” developed under Haizlip into a Black Arts salon that was cooler than the “The Flip Wilson Show” and Don Cornelius’ large Afro. Wald wisely includes as much of Haizlip’s life story into this book as she can fit. (A documentary film on the “Soul!” producer, done by his niece Melissa Haizlip, is struggling to get funding.) The letters of support “Soul!” received are well used in Wald’s book; they show the involvement of the Black community instead of just describing the appreciation of an audience. “It’s Been Beautiful” builds somewhat on Devorah Heitner’s “Black Power TV,” a pioneering 2013 intellectual narrative on the early days of East Coast Black public affairs television, and does so with great intellectual gusto. Wald, a professor of English and American Studies at George Washington University, rightly uses the New York-based “Soul!”—a program that would feature, for example, Nikki Giovanni interviewing James Baldwin or a studio performance of The Last Poets, or Earth, Wind and Fire—to find “a key TV text of the era or as a cultural project joined by common cause to 1960s and 1970s political struggles.” The show’s arc matches its era: Martin Luther King, Jr. was killed two weeks before the grant to create the show was submitted, and it was cancelled because PBS’ funders, facing the onslaught of the Nixon era and the fading of the Black Power movement, wanted to create programming that would have Blacks and whites interacting. Chapters Three and Four—which dissect “Soul!” as a program, along with its performers and producers—are worth the price of the book alone. Wald does not shy away from explaining Black American culture in all its glory and anger. But she doesn’t seem to want to dig into the African, non-Western roots of what she is seeing and describing. She correctly emphasizes the ideological and cultural diversity of the performances, and explores the unity-without-uniformity cultural and political ideology present at the time, but doesn’t want to go in-depth into how Africans in America came to create those products and their ideas in a world drenched in white supremacy and anti-African-ness. Instead, Wald chooses to emphasize the gender and sexual orientation undercurrents of the visual text: “’Soul!’ created a television space where Black people—imagined to include Latinos of various hues who were seeking alternatives to whiteness, Black women marginalized by nationalist conceptions of both the public and private spheres, and Black gays and lesbians rendered as ‘unnatural’ and ‘freakish’—could see, hear and almost feel each other.” For example, she seems more interested in Haizlip’s negotiation of his public gayness than the undiluted African thought processes that produced him and his approach to Black art and the Black community. Wald is not ignorant of African-centered thought; she doesn’t think it’s intellectually relevant enough to examine when quotes from Black Arts Movement stalwarts will do. The 21st century public television landscape is deeply complicated in ways that this book’s bell-bottom era forecasts. The fact that, for example, on “The PBS NewsHour,” one will find in 2015 occasional in-depth discussions of African and African-American artists and their work is the realization of public broadcasting’s assimilation goals. (After reading Wald, the cross-cultural appeal of PBS’ “Tavis Smiley” could been seen as a page out of a memorandum written by the 1970s PBS executives.) And the 2015 decision by the Sesame Workshop to sell first-run rights of “Sesame Street” to premium cable outlet Home Box Office shows that funding and producing these non-commercial programs are still challenging, even for PBS’ signature programs. So Wald accomplishes with her detail the goal of all scholars: to be both historical and current. 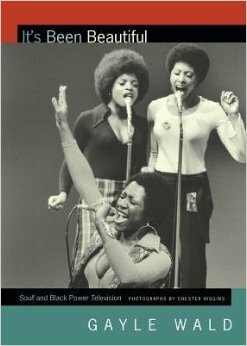 Wald’s and Heitner’s approach to analyzing Black media—focusing on the televisual performance and its socio-political and socio-cultural implications, grounded in European-approved disciplines of American (film) studies, (Black) feminism, queer studies, et. al.—provides both a fascinating read and important scholarship. (Anyone interested in continuing their newly-established tradition should seriously consider studying PBS’ “With Ossie and Ruby,” an almost-forgotten treasure of a Black cultural container similar to “Soul!” in important ways. A study from those perspectives would be fascinating, and perhaps a scholar will one day attempt it.) Ultimately though, Black people need scholarly narratives of these Black cultural television programs from the unapologetic point-of-view of African-centered thought and philosophy.